There have been many advances in the field of freelance writing over the last few years: for most publications it is no longer necessary to send in an SASE (self-addressed stamped envelope) query; electronic payments outpace snail mail checks; social media has made it easier to connect to other writers and editors, etc. The business side of freelance writing has gotten easier with more online applications streamlining mundane tasks many writers loathe. 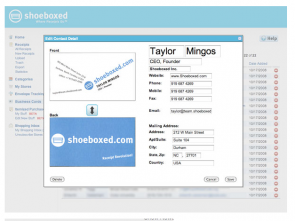 Shoeboxed is one great app that moves shoeboxes full of receipts out of the closet and into cyberspace. in addition to the unlimited self-scan option that is available on all of the other plans. Initially, I worried about sending my receipts and precious contact info (via business cards) off to some random address. Fortunately, Shoeboxed provided their own cute blue SASE envelopes to send my items in AND I was able to track the envelope’s progress through the Shoeboxed system. The company returns all materials within a couple business days, which is great for buyer’s remorse or tracking rebates. The turnaround time for my mail-in receipts was quicker than the plan indicated. Instead of 2-3 business days, I found my receipts online by the end of the next business day. Using the app for iPhones was just as easy as popping the receipts in the mail and maybe even easier because I could do it as soon as I received the receipt. A couple camera clicks and a business lunch was logged and added to the expense tracker – it would make any tax accountant proud. I do have an issue with the unpaid plan. The business card scanner app automatically sends an email to the contact information provided. Potential new client? Bigwig you want to impress? 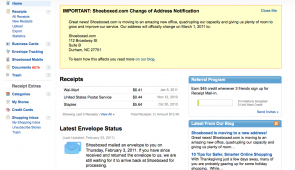 Shoeboxed is going to send them an email and the only way to disable this feature is to upgrade to a paid plan. This is one feature Shoeboxed should remove from the mobile app. I really didn’t want to learn a new system and spend gobs of time reconciling it with the programs I already use for invoicing, taxes, etc. Good thing this program interacts seamlessly with other popular bookkeeping programs like Quicken and Freshbooks and all the information can be exported into Excel and CV files. The open and self-explanatory interface makes it easy to find the information you need, while the reporting areas makes it easy to figure out where the money is spent. The program organizes your receipts by type and creates reports to show the amount of money spent on each category including online purchases – a great tool for any business owner. The business card tracker is just as helpful. It puts the information from the card into a contact management system that you can edit. The front and back of the card is scanned so any info you need is available when you need it. The best part is the info extracted from the card can be downloaded to most popular contact management systems like Gmail, iPhone/AppleMail, Yahoo, Blackberry, etc. Shoeboxed made it easy for me to keep my finances and contacts organized for the whole month. I didn’t miss my weekly input chore and I was able to access info from anywhere. 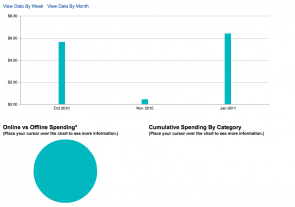 Using the Shoeboxed reports helped me define a better budget for both my business and home. I don’t like spending money, but this app is well worth it. What apps help you keep your business moving? Full Disclosure: FWJ’s parent company, Splashpress Media, has an affiliate connection, however that relationship had no bearing on the nature or content of this review.